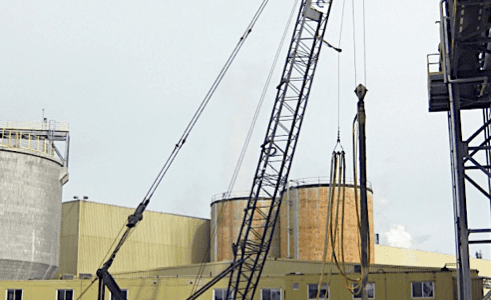 Catalyst Paper has proposed constructing a new Turbine Generator / Condenser at their Pulp Mill in Powell River, BC. The new facilities will be supported by a mat foundation over densified ground to a depth of 19 m. This phase of the project involved a ground improvement treatment area of approximately 250m2 beneath the Condenser foundation. 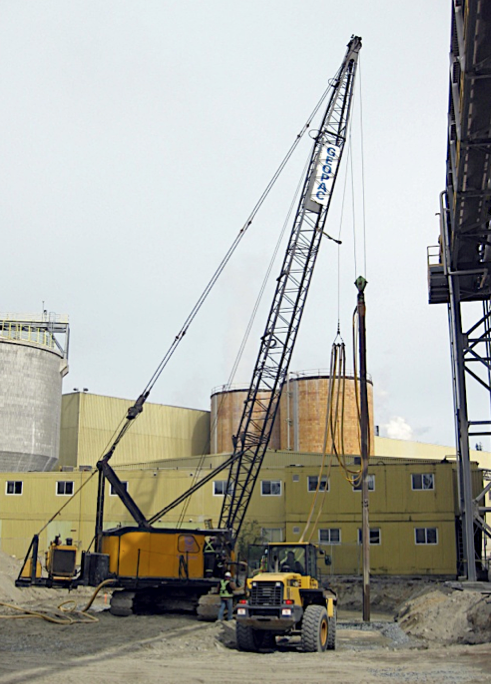 The proposed site for the new Condenser is located within an operating industrial environment at the heart of the Powell River Pulp Mill. The site is surrounded by numerous existing mill structures, tanks, services and underground utilities. Test holes indicate the site below surface is underlain by about 8 to 10 m of granular fill overlying sand and gravel deposits. The fill comprises sand, gravel and cobbles which are generally compact, except for a 3 to 4 m thick surface layer which is dense to very dense. The underlying native sands and gravels are generally compact. Both the fill and native soils were found to contain cobbles and boulders. Initial soil conditions were not adequate to satisfy seismic design criteria in terms of foundation deformations.